Meet Miss Piglet. This was my second attempt at making a cochet toy back in 2011. It was made for my neice. 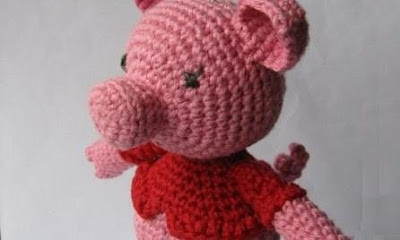 She used to be besotted with everything Peppa Pig (now superseeded by My Little Pony) - so I thought a piglet it will be. This is currecntly the only photo I can find of the end result. She is worked in a lovely DK Cotton on 3.00 mm hook. And yes I made the pattern up. Although I did get some inspration for the red top from a tutorial. My next job is to write it out and hopefully post the pattern. Oink Oink!